Lloyd Mutungamiri, an editor of two newspapers in the tiny southern African nation of Lesotho, has been shot. He is “reportedly stable” in hospital. The editor of the Lesotho Times and the Sunday Express “was attacked and shot at his place this night [July 9] around 23:45hrs by unknown men”, wrote journalist and free speech activist Tsebo Mats’asa on Twitter. Mats’asa, director of Lesotho’s Media Institute of Southern Africa (MISA-Lesotho), also released a statement with more information. “Lloyd was from his office [when he was shot] after completing the Sunday Express issue which is a sister newspaper for Lesotho Times,” reads the MISA-Lesotho statement. Keiso Mohloboli, a journalist with the Lesotho Times and Sunday express, told me via email that Mutungamiri is in a “critical” condition. “He is our hope,” says Mohloboli. She also tried to visit Mutungamiri, her editor, in hospital but said “for security purposes” only his wife is allowed to see him at the moment. “His wife was confused and crying,” she said. African Independent, an online newspaper, reports that the editor’s wife, Tsitsi Matope, suspects the army is behind the shooting. Both the editor and his wife, who is also a journalist, are Zimbabweans. Mohloboli’s assessment of her editor’s health as “critical” and “fighting for his life” – compared to MISA-Lesotho’s more measured words of “relatively stable” – reflects some confusion over the editor’s current wellbeing. Mohloboli recently had her own brush with fear when she was arrested over an article she wrote about Lesotho’s controversial and unpredictable army chief, Tlali Kamoli. She says she was held by the authorities on June 23, then released. The police were pressuring her to give them the names of her sources. Despite her release, she still fells unsafe. “I don’t know how I am but I am alive,” she says. Mohloboli suspects the shooting of Mutungamiri may be linked to the publication of her article, ‘Exit strategy for Kamoli’, which appeared in the June 23-29 edition of the weekly Lesotho Times. 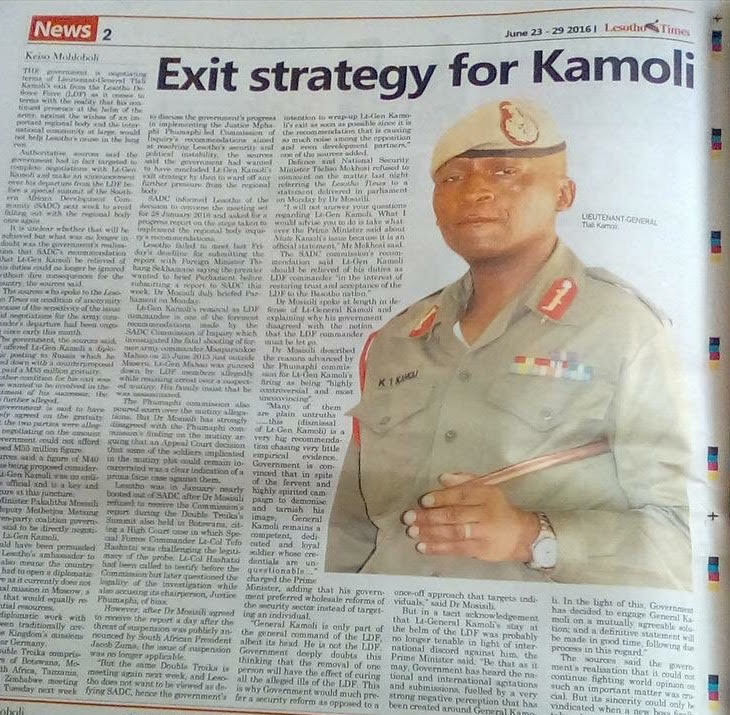 Liutenant General Tlali Kamoli, the army chief, was reported to have been offered a “golden handshake” in return for standing down. Mohloboli was reporting on this story. This article, likely at the centre of these events, was also mentioned in the MISA-Lesotho statement. Lesotho’s media is currently battling more than it’s fair share of troubles, and the common denominator seems to be Kamoli. It was reported on July 8, 2016 that the owner of the Lesotho Times, Basildon Peta, has been charged with “defamation and crimen injuria” over a “satirical column” written by an anonymous writer which is said to have “severely undermined” army chief Kamoli. Political instability and sporadic violence have become common in the landlocked country, which is completely bordered by South Africa. In the wake of this recent shooting, Lesotho Daily News has offered background on the current violence gripping the nation. The Facebook page refers to army boss Kamoli as a “rogue military commander”. The Southern African Development Community (SADC), a regional bloc, wants Kamoli to step down. Despite this disturbing turn of events, Lesotho is some way from becoming a failed state. When walking down the main streets of the capital Maseru, one feels outwardly safe and there is no obvious threat in the air. That said, the country of two million people is steadily heading down a dangerous path. “Intimidation and suppression to media won’t bring back political and security stability to Lesotho,” writes Mohloboli on Twitter, adding that “an injury to one is an injury to all”. Lesotho was ranked 73rd out of 180 countries in the Reporters Without Borders 2016 press freedom index. Expect this ranking to get worse next year. Reblogged this on misalesothoblog Moqolotsi.